How can I track my company's emissions over time? The world's leading climate scientists have warned that massive and unprecedented changes to global energy use and infrastructure will be needed to limit global warming. To stay below 1.5°C of warming we will need to reduce global greenhouse gas emissions by 45 percent below 2010 levels by 2030 and reach net zero by 2050. We have a huge task ahead of us, but it is not impossible. The first step in reducing your carbon emissions is to measure them. CarbonKit provides all the data and models necessary for calculating various greenhouse gas emissions in categories such as car, train and air transport, types of fuel or country-specific grid electricity, electrical appliances, agricultural and industrial processes and building materials. CarbonKit has models for hundreds of different emissions categories. Each model is individually documented in the CarbonKit website, with a page that describes how it works, where it came from, relationships with other models, and so on. 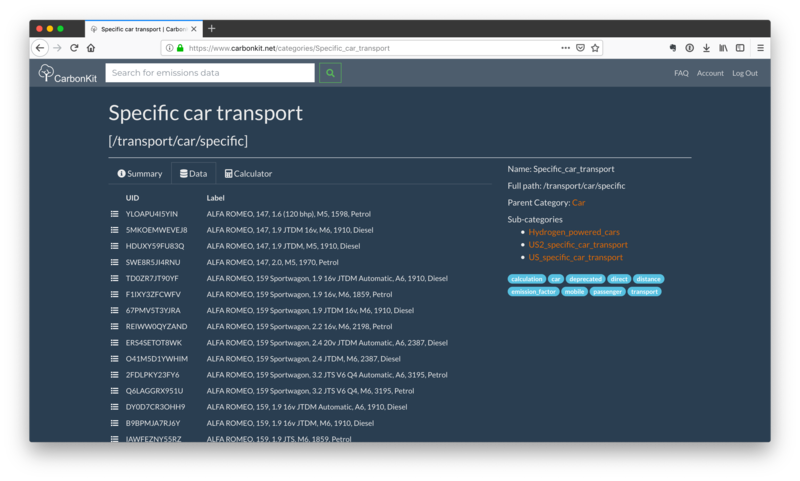 CarbonKit includes powerful search and tagging capabilities, making it easy to find the models relevant to your application. Every model in CarbonKit that supports calculations has a Calculator tab where you can perform ad-hoc calculations. For example, it is simple to calculate that a flight from London to LA will produce 1054.0811 kg of CO2 (per passenger). 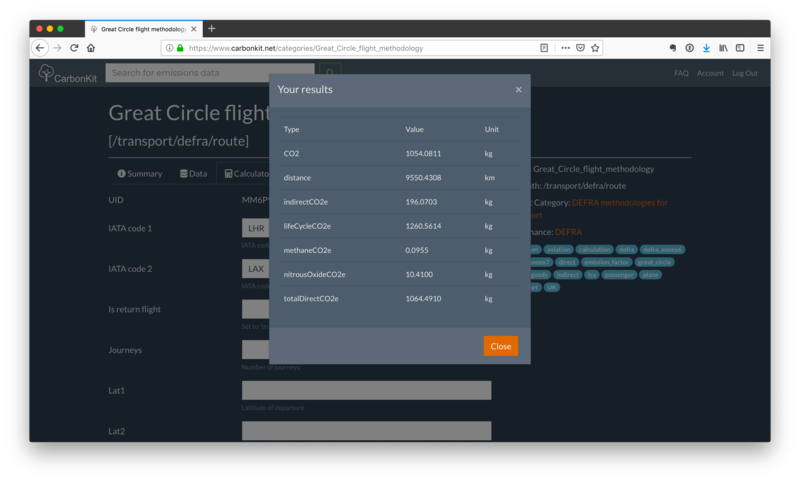 Embed environmental intelligence from the CarbonKit platform directly into your applications or systems using the CarbonKit API. You can use the CarbonKit API to store your inputs permanently, so that you can retrieve them later. Most data changes over time, particularly when dealing with energy use. The CarbonKit API allows you to store time information along with your inputs, so that you can build up a sequence of data over time. It can be hard to know how to start tracking your carbon emissions. With CarbonKit you can discover, calculate, store and process data and information related to all your greenhouse gas emissions.